Authentic Extra Virgin Olive Oil pairs nicely with the good ole potato. Not deep fried, greasy chip style or smothered in butter, cheese and bacon… but prepared in the direction of this attached recipe, just baked with #REAL olive oil, and you are packing polyphenols. Why not try this at your next get together? We are quite aware that unadulterated, fresh Olive Oil is an antioxidant power house but did you know Potatoes also contain a variety of phytonutrients that have antioxidant activity? Among these important health-promoting compounds are carotenoids, flavonoids, and caffeic acid, as well as unique tuber storage proteins, such as patatin, which exhibit activity against free radicals. For detailed nutritional info click here- POTATOES. Get your health on, Mediterranean Style! #thereisadifference —Follow us on Facebook for more tips and recipes or talk to us here! 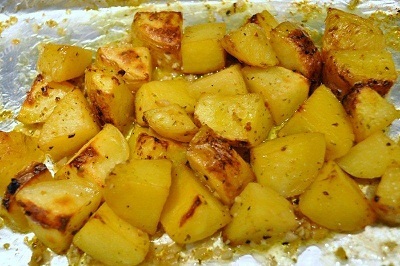 This entry was posted in Uncategorized and tagged greek lemon potatoes, greek potato recipe, recipe Mediterranean diet. Bookmark the permalink.